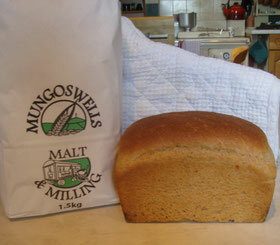 Makes one 900g/2lb loaf or two 450g/1lb loaves. 2tsp Dried Yeast or 15g/ ½ oz Fresh Yeast. 1. Prepare the yeast – mix yeast, sugar, 125ml of warm water and 2-3 tbsp of the flour into a cream. Leave in a warm place for 15mins until the yeast is working actively and the mixture is frothing. If using dried yeast, make doubly sure it is completely dissolved and frothing well. 3. Pour the yeast mixture into dry ingredients along with the rest of the water, to create a dough. 4. Knead well until quite smooth and elastic. 5. Place in a large, lightly greased, warm bowl. Cover and leave till doubled in size. 7. Shape and place in either 1 or 2 tins. 8. Cover and leave to rise to nearly the top of tin. 9. Bake in the centre of a moderately hot oven, gas 5, 375°F, 190°C, for 45 to 50min until golden brown. To test, slip loaf out of tin into a clean cloth and tap the bottom. It will sound hollow when loaf is done. 10. Served sliced and buttered. Toasts and freezes well.